You already know the benefits to training like improved productivity, better staff morale and a higher level of client care. But sometimes, the road to training has a number of barriers that can be difficult to overcome. Careerforce are introducing a number of initiatives aimed to help you break through the barriers to training and get your organisation on the way to qualified staff. We aim to help you save money, save time and reduce your risks. So you can enable your staff to provide the best support they can give your clients. Have a read of our initiatives and contact your Careerforce Workplace Advisor if you want to know more. Save $50 on enrolment fees from now until the end of the year. 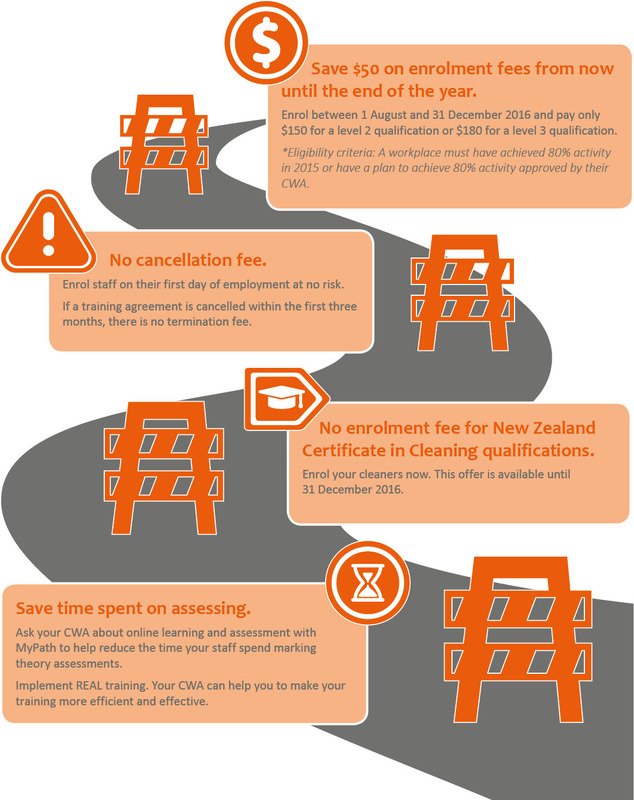 No enrolment fee for New Zealand Certificate in Cleaning qualifications. Save time spent on assessing through MyPath.